You know the benefits that RFID can provide; accurate tracking and management of assets, inventories and processes, but you’ve not been able to find a way to do it with commercially available products. You’ve been told it can’t be done. Challenge us. We’ve come to expect the unexpected, and our team of RF scientists and experts can help you architect and develop the right solution. We’re challenging the boundaries of what’s possible – from embedded RFID to high temperatures to chemical and impact resistance we understand how to customize products to ensure they meet your application and your expectations for the highest quality. We’ve developed custom RFID solutions for companies around the globe in some of the most challenging environmental conditions. Omni-ID’s award-winning, patented technologies excel in solving tracking and identification challenges with unprecedented accuracy for industry. Organizations like Daimler, Cisco, Whirlpool, NASA, USMC, Boeing, Ford, Mitsubishi, Honda, Stanley Black & Decker, along with several large Oil & Gas industry customers trust Omni-ID to develop custom solutions for their toughest applications, again and again. Omni-ID and Systems Integrator Lyngsoe Systems together defined the functional and technical specifications to create a new tag to manage a pool of trolleys used for the transportation of plants in the European horticultural industry. 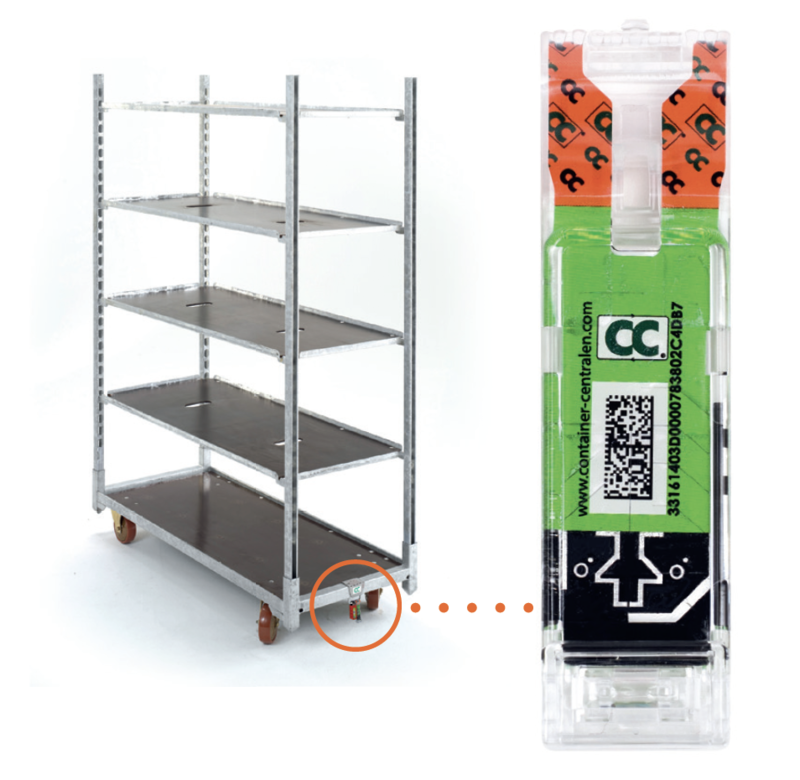 The new passive EPC Gen 2 NXP Ucode8m-supporting RFID tag was launched in early 2019 and CC has successfully tagged 4 million trolleys across 40 countries. Read this interview between Container Centralen and Omni-ID’s CEO, Tony Kington to learn about how the tag was designed specifically for the CC customer to minimize counterfeiting and enable customers to optimize logistical and track-and-trace processes. Article: Major automobile manufacturer uses Omni-ID 64 kbit tag to monitor engine production. We start with your requirements, every time. We understand that enterprise asset management is a critical part of your operations and one size does not fit all. Our teams of RF scientists, engineers and field teams will work directly with your staff to design a solution that achieves your business goals, simply and cost-effectively. Part of that equation is the quality and pride we put into developing, designing and manufacturing all of our custom and commercial products. Omni-ID’s 100% testing process ensures every tag works right out of the box every time. All of our products must pass our stringent testing and quality assurance processes. Here are just a few of the custom solutions developed by Omni-ID’s team of experts. Designed to assist in Motorola’s inventory management process, an RFID custom tag was developed to embed into a volume-control knob which can be retrofitted into two-way radios enabling users to conduct inventory counts of 50 radios in six seconds, instead of four minutes. Read RFID Journal Article. Gaining Operational Efficiencies from Real-Time Visibility From the service van – to the construction site – the manufacturing floor or the operating room – you need to know the location, destination, and maintenance records for the tools and equipment you or your clients use every day. Omni-ID’s solutions for tool tracking can do just that and more. We understand harsh outdoor environments present an immense challenge, whether it be sub-zero temperatures, exposure to salt water or risk of explosion. That’s why we designed this tag with a rugged over-molding for extreme durability and use in dangerous environments, earning ATEX and Class 1 Div 1 certifications. With the strength to withstand 2000 kg of compression you won’t have to question whether your tag can survive the conditions. We also integrated smart technology in order to regulate voltage for consistent performance in any environment (-40°C to +60°C) without draining the battery. From the arctic to the ocean to the desert, Omni-ID tags have endured the harshest conditions without fail! Developed to track bags of corn seeds, an agricultural high-tech listed company, located in Laizhou, Shandong province enlisted the expertise of Omni-ID to track bags of corn to assure quality, prevent loss of inventory and avoid anti-counterfeiting. The Omni-ID corn tag shaped like a kernel of corn was created to meet the needs of this top Chinese seed industry company. Designed specifically for fast and reliable vehicle identification, Omni-ID’s passive UHF RFID labels are optimized for attachment to windshield glass and ideally suited for road toll collection, parking permits and access control. Power 400: Watch the video above to see how our Power tags literally crush the competition! PINC depends heavily on a smooth-running supply chain to get its food from the warehouse to the customer’s dinner table. Adept 400 — Home of the “Sledgehammer Proof” Tag! Reliable asset tracking solutions for the harshest environments.